James ‘Jim’ Bridenstine, newly appointed NASA administrator, spent a full morning and early afternoon touring facilities at the NASA Armstrong Flight Research Center, located at Edwards Air Force Base Aug. 28. Later in the afternoon, he stopped by Scaled Composites hangar at Mojave Air & Spaceport for a media advisory. 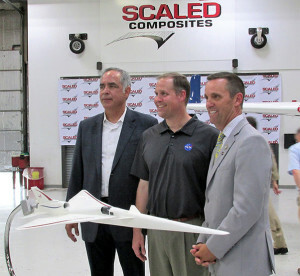 When asked about programs that are underway at NASA, Bridenstine said, “We’re working on a new generation of X-planes at NASA, especially at the Armstrong Flight Research Center. “A couple of these X-planes are behind me. 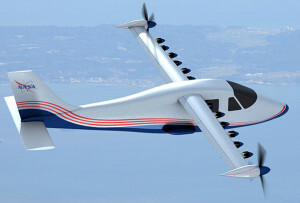 The X-57 Maxwell is the world’s first all-electric airplane, and is on the brink of being able to fly,” he said. The X-57 is a modified Italian Tecnam P2006T General Aviation aircraft. The wing has been removed and replaced with a high-aspect ratio experimental wing with 12 small high-lift electric motors mounted on the leading edges of the wings, six on each wing and two larger electric ‘cruise’ motors mounted with wingtip nacelles. “When landing, the 12 small motors would start again, and centrifugal force would cause the propeller blades to unfold and create the appropriate lift for approach and landing,” he concluded. Brandon Eden, Bridenstine and Rep. Steve Knight, R-Calif. 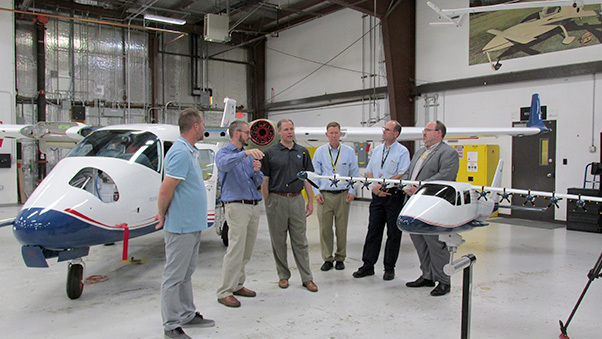 When Bridenstine talked about uses for all-electric aircraft, he said, “One area that I think is important for the transformational capabilities for our country, economically, is urban air mobility. “The idea that we could fly from one side of the city to another side of the city, in essence, like a taxi. Make it autonomous, so it’s not piloted, beginning with moving cargo or package delivery, before carrying passengers. A model of the Lockheed X-59 QueSST (Quiet Supersonic Technology) being developed for NASA’s Low-Boom Flight Demonstrator program was on display. “We want to fly across the United States in half the amount of time that it normally takes,” Bridenstine said. “In order to do that, we have to fly faster than the speed of sound,” he said. “The sonic boom created by exceeding the speed of sound is a challenge, because it is prohibited across the U.S. and over most of the world. During his visit to the Mojave Air and Space Port, Bridenstine received a briefing on the X-57 Maxwell. A question was asked about Mojave Air & Spaceport being used for commercial space flights and Bridenstine said, “We want, not only sub-orbital space flight to be commercialized, we want orbital space flight to be commercialized. “We want people to be able to fly in low-Earth orbit for commercial purposes. It could be tourism, it could be research, it could be manufacturing, or it could be a whole host of different capabilities. It could be the development of pharmaceuticals, for example. “We want it to be commercialized because when low-Earth orbit and sub-orbital flight are commercialized, NASA then can use its resources to do more than we have ever done before. “We can take our resources and go back to the moon and we can go on to Mars and we can create architectures that enable us to get back and forth to the moon in a sustainable way. “So, that really is our objective, so we fully support and do everything we can to help commercial industry to be able to create the business case for low-Earth orbit. 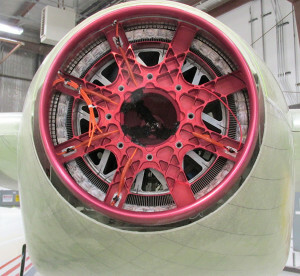 Of course, a lot of the companies that are engaged in that activity are right here in Mojave.” There are numerous space companies operating at Mojave Air & Spaceport, including: Masten Space Systems; Virgin Galactic/The Spaceship Company; Northrop-Grumman Innovation Systems (formerly Orbital ATK); and Scaled Composites StratoLaunch Systems. 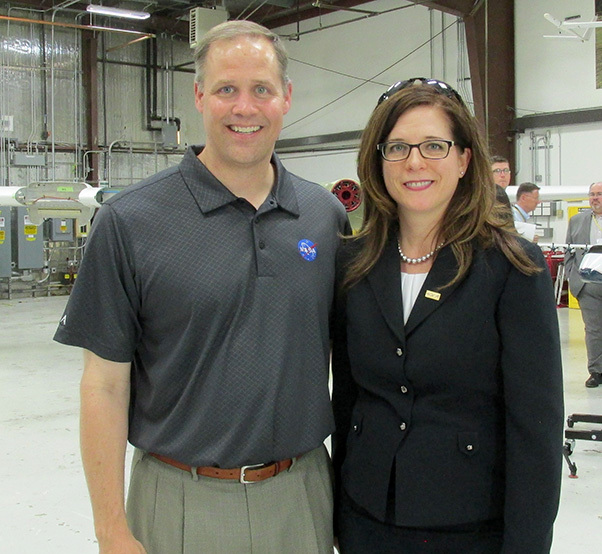 Bridenstine and Karina Drees, CEO and general manager of the Mojave Air and Space Port. When asked about support of Congress for NASA, the response was very pro-active. “We are actually seeing more bi-partisan support for NASA than we have for a long time and that’s very positive. So, NASA is very healthy.” A recent increase in the agency’s budget demonstrated support from Congress and the White House. “It’s been a long time since we’ve flown American astronauts on American rockets from American soil. 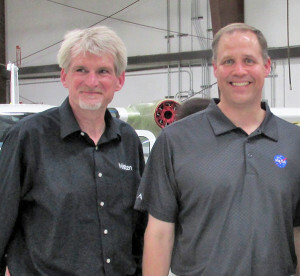 In fact, the last time we did that was in 2011, with the final flight of the space shuttle,” said Bridenstine. “Here we are almost eight years later and we still haven’t flown any of our rockets. The challenge was we retired the space shuttle without replacing it. “We have made this mistake before in our history,” he said. “We look at the end of the Apollo era. We ended the Apollo program without a replacement for Apollo and we had an eight year gap before we got to the space shuttle. And now we ended the shuttle program without a replacement. But now we are finally getting to the point where we are on the brink of launching American astronauts on American rockets on American soil and the best part of this is that the government isn’t going to purchase, own and operate the rockets themselves. We are buying the service. So, what we are doing is buying access to space as one customer of many customers, with multiple providers all competing on innovation and cost. Bridenstine and Ben Diachun, CEO of Scaled Composites. “That’s the vision, that’s the model and we are almost ready to do that with two providers, one being Boeing, with a launch provider being ULA and the other being SpaceX,” he continued. “That will be transformational for the United States yet again, to have our own access to low-Earth orbit. But, I think another important point to make is, we don’t want to repeat this same challenge that we’ve had with the launch capability for the International Space Station. Bridenstine expressed the need to plan ahead now to be ready when the ISS becomes unsustainable. He posed the questions of how to have non-government companies achieve low-Earth orbit now and have commercial habitats in space or space stations in orbit for commercialized space customers, like NASA, rather than be owner-operators, thereby driving down the costs, which would enable NASA’s resources to go further. “We will go to the moon within ten years! But, we have to do a couple of things first — we need to utilize commercial space partners,” he said. 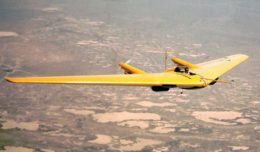 The National Advisory Committee for Aeronautics (NACA) was formed on March 3, 1915, and NASA — the National Aeronautics and Space Administration — was formed in 1958. The electric motor on the X-57 Maxwell. NASA technology and inventions have been improving life on Earth since its founding. “If you think about how we navigate using GPS (global positioning system) for example, or how we produce food,” said Bridenstine, citing examples of NASA innovations in action. He told about a farmer in Nebraska who explained how technology from NASA has helped him to produce a higher yield on his crops. Bridenstine also pointed to advances in weather forecasting technology as an area in which NASA has made significant contribution. “Eighty percent of the data that helps us understand and predict weather is collected from satellites built by NASA or NOAA.” (National Oceanic and Atmospheric Administration). 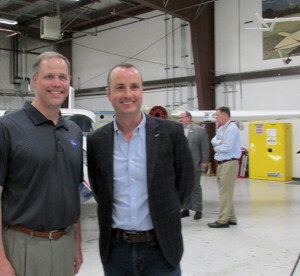 Bridenstine’s enthusiasm was evident and Starr Ginn, Deputy Aeronautics Research Director at the Armstrong Flight Research Center said, “He has been like a kid in a candy store all day long!” Ginn has served as portfolio manager for Hybrid Electric Aircraft Research at AFRC on many projects, including the X-57. “You can imagine, I get that question everywhere I go,” Bridenstine said. “NASA is about exploration, about discovery, about science and technology, that’s who we are and that’s what we do. Bridenstine also met with Dave Maston of Maston Aerospace during this visit to the Mojave Air and Space Port. “We don’t do national security. That being said, before I was a NASA administrator, I was in the House of Representatives and I can tell you firsthand as a member of the House of Representatives, I have voted on the Space Corps, which is very similar to the Space Force. Bridenstine said, “All of the Space Force would be separate from NASA. It would not be a NASA program. However, I would say as a NASA administrator, we as a society, we are dependent upon space. If there’s no space, cell phones don’t work because of the time signals from GPS satellites, the electricity on the grid and banking systems won’t work, all of these things mean we are dependent upon space.